Great interview and video of Pat Cohen, creator of incredible deer hair bugs. Check it out! 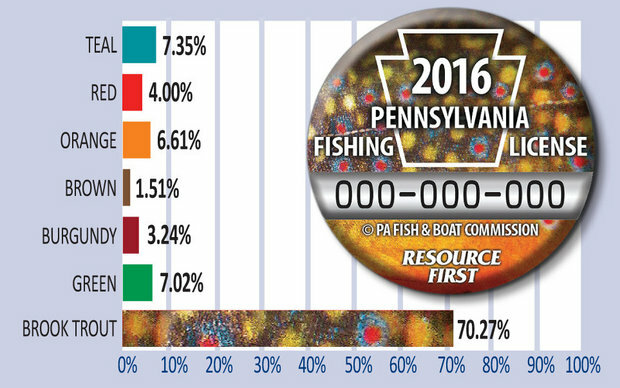 The Pennsylvania Fish and Boat Commission chose a brook trout pattern for their fishing license button. In fact, it won in a landslide. Of course, I don’t see any other fish patterns represented. 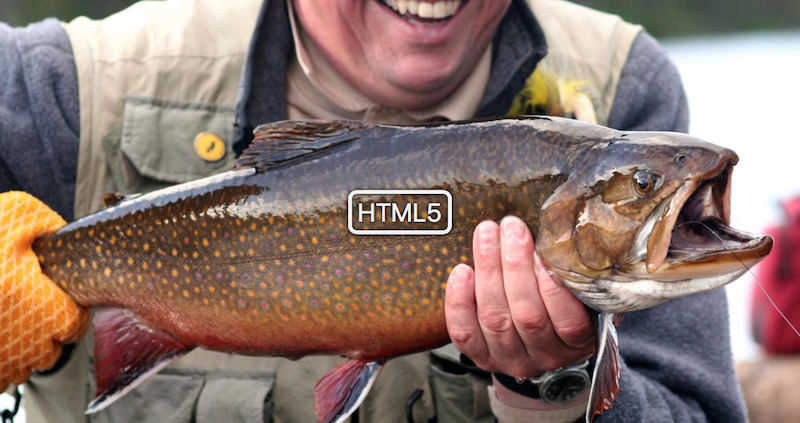 If you’re up against green, red, brown… why would you not win if you were the color “brook trout”? Spawning Brook Trout – Now? When exactly do brook trout spawn around here? While there is no alarm that rings and signals it is time, it does begin in the fall. Depending on where you get your information, in Virginia, that time may be here. Many brook trout are paired up or have already spawned. This is a controversial topic and we respect informed anglers decisions to fish or give the brook trout a break. Our shop does not guide on brook trout water during this season nor do we actively fish mountain wild waters now through winter. We understand many responsible anglers enjoy this time of year in the mountains. We ask that anyone fishing please do your best to stay out of the creeks as much as possible to avoid stepping on redds or possibly coating fragile eggs with silt stirred up from wading. Return fish quickly to the stream and observe the pools for actively spawning fish and redds. Remember that brook trout eggs will incubate on the streambed for 45-140 days depending on water temps! This means you will need to be careful in these creeks until early March most years! Enjoy the colors in the mountains and the great fishing but please be cautious. We want to ensure a great spawn this season. The brook trout are spawning now and most anglers believe it is best not to stress them by fishing for them even though we return them to the stream. Brook trout spawn in the fall, most typically from early October to mid November within park streams. Spawning is triggered by decreasing day length and water temperature. Shallow depressions know as redds are excavated by female brook trout on typically gravel substrates. Redds are initially defended by both sexes followed by abandonment upon the completion of spawning. Hatching typically commences during mid to late January within park streams and juvenile fish begin to vacate redds by mid March. I was on the Rapidan last week and I did not see signs of fish spawning there yet. However, that was at lower elevation and in roughly the middle of the park. Farther north and higher up on the Blue Ridge, spawning is likely to be underway. It’s good to be aware of all this, and if you do fish, try not to step in the stream when you don’t have to. And don’t be greedy. It is easy to spot brookies when they are sitting still in the current guarding their redds. Brook trout are under pressure in a ton of ways. Choosing to avoid fishing for them while they are spawning is a personal choice, but spawning is a critical time for them to successfully reproduce, so please go easy if you are out there. So why am I posting something about fishing in the Bahamas on this blog about brook trout fishing? Because, like many fly fisherman, I am not restricted to a single type of fishing or a single species when I fish. One of the things I have enjoyed in recent years is going to the Bahamas to target bonefish. As many of you know, the Bahamian government has proposed new regulations aimed at fly fisherman who fish the flats (original document here). This could drastically change and likely end unguided fishing in the flats in that country. My views on this are pretty simple. I have no problem with the idea of purchasing a fishing license to chase bonefish in the Bahamas. In fact, the first time I went there on a DIY trip, I asked the owner of the place we stayed where I needed to go to get a license. He laughed and said there is no need for a license to fly fish the flats in the Bahamas. I also discovered other aspects of these laid-back islands, such as no open container laws, and the rental car “agreement” was just handing over the cash and getting the keys to the car. This is part of the appeal of the out islands. Things are very informal. It’s nice. But as far as fishing licenses, again, I would gladly pay a reasonable amount. So part of my problem with these draft fishing regulations is the proposed cost for unguided anglers to fish the flats. Aside from the one-time $10 application fee, it’s $20 per day. Several bloggers and commenters on their sites think that’s not unreasonable. I think it is. For a comparison, this past April I purchased an annual out-of-state saltwater license for Florida for a total of $49.97. That allows me to fish in Florida’s extensive saltwater fisheries for an entire year. In the Bahamas, that will pay for two days of fishing (including the application fee) under this proposal. Even Mexico charges about what Florida does for an annual license. DIY Bonefishing – Proposed Bahamian Fishing Regulations – Is The Sky Falling? Gink and Gasoline – Is Flats Fishing In The Bahamas Over? Aside from restricting foreign ownership of lodges and participation in guiding, for the do-it-yourself angler, the process for obtaining a permit is vague and, based on what is written, troubling. In order to get a permit, the process appears to be controlled by fishing guides. In addition to the government possibly issuing permits (it’s unclear), the draft mentions that lodges and guides will issue permits (this is clear), and further, those lodges and guides can restrict access to areas where unguided anglers are allowed to fish. Section 4 (6) (c). A permit may be granted subject to such conditions, restrictions or limitations as the grantor considers appropriate. And what is the penalty for violation? “Summary conviction,” which can be up to three months in prison and a $3,000 fine. In other words, no trial. You can be arrested on-the-spot and, worst case, hauled off to jail for three months. Nice. From what I’ve read, it sounds like a contingent of Bahamian lodge owners and guides have gotten together and lobbied the government for this, and the practical effect is going to be a ban on unguided fishing throughout the islands. Not a good thing, and hopefully this is a bad interpretation of what is being proposed and it does not come to pass. But the way it’s written and, more importantly, the way people who are familiar with the fishing industry in the Bahamas see it (links above), a ban on unguided fishing is exactly what is being proposed. Send your comments by Friday, June 26th 2015 to fisheries@bahams.gov.bs and primeminister@bahamas.gov.bs.